This tour takes you down the backroads, passing beautiful landscapes and authentic villages, as you follow in the footsteps of two of the most famous painters of all time: Claude Monet and Vincent Van Gogh. The goal of this tour is also to reveal the evolution of painting at the end of the nineteenth century and to explore the progress from Impressionism through to post-Impressionism. Van Gogh Vs Monet !!! This is definitely one of our most relaxing excursions, dedicated to nature and art lovers! Your expert guide will show you some outstanding highlights on this day-trip. This tour is a combination of the Giverny and Auvers-sur-Oise tours. Your Licensed English Speaking Guide will pick you up from your hotel or apartment in Paris in a deluxe private vehicle and after a one hour drive, you will arrive at the beautiful village of Giverny, situated at the gates of the Normandy region. Upon your arrival, you will be given an introduction by your private guide to the world of Impressionism and the life of Claude Monet. You will start your day with a visit to Claude Monet’s house and gardens. Enter with your guide through a special entrance without queuing. He will give you the tickets we have bought previously for you. 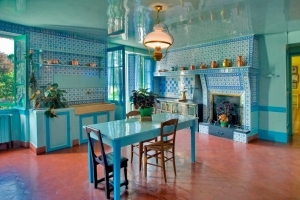 Claude Monet lived in his home at Giverny for forty-three years, from 1883 to 1926. In 1890 he became the owner of the house and gardens and transformed them completely. You will follow your experienced guide, first for a visit of the Water Garden with its famous Japanese Bridge and Water-Lily Ponds covered with wisteria, before discovering the Flower Garden in front of the house called the Clos Normand, which is incredibly beautiful from April to October (the various flower varieties are blooming successively, so that the garden changes gradually with the seasons whilst maintaining its colours and brightness). Enter with your guide inside the house and discover the first studio of Claude Monet, his bedroom, the dining room, the kitchen and his fabulous collection of Japanese engravings. It is now time to have wonderful lunch (not included in the cost of the tour) on the terrasse of the famous Hotel Baudy in Giverny. It is a place charged with history, located right in the centre of the village of Giverny where you will be amazed by its ancient rose garden. At the end of the 19th century Giverny became the capital of Impressionism when a substantial colony of burgeoning Impressionist artists, mainly Americans (Willard Metcalf, Louis Ritter, Wendel…) settled there to work , inspired by the landscapes, the overall atmosphere, and the presence of Monet. 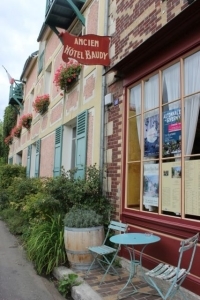 Even nowadays, the Hotel Baudy is still a famous meeting place for Americans. Enjoy the scenery whilst driving on the countryside road to reach Auvers-sur-Oise, a typical village situated 30 kilometres to the North of Paris. 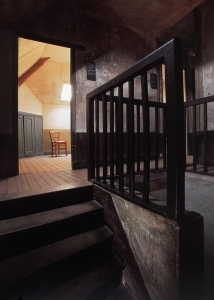 You will start the afternoon with a visit of the Auberge Ravoux, known to be the last home of Vincent Van Gogh. It is quite an overwhelming experience when you discover the room where the Dutch Painter lived and died at the young age of 37. During the last 70 days of his life that he spent in the Auberge, Van Gogh created more than 80 paintings and 64 sketches before shooting himself in the chest on the 27th of July 1890 and dying two days later. 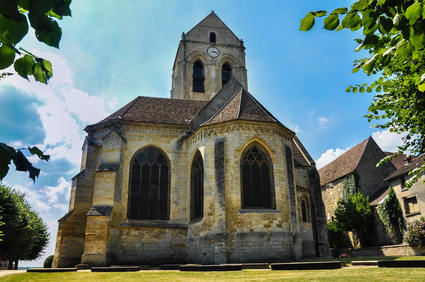 After the visit, you will enjoy a walk through Notre Dame d’Auvers, the famous 12-13th century gothic Church at Auvers, painted by Van Gogh in 1890, which now hangs in the Orsay Museum in Paris. Before returning to Paris in the late afternoon, you will conclude the tour with a final stop at the cemetery where both Vincent and Theo Van Gogh are buried side by side. Tickets to Giverny are not included (no waiting in queues).